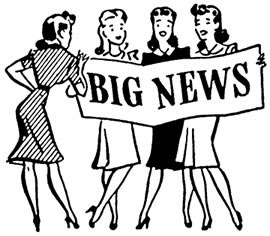 the cottage gals: BIG News! Ann and I are so excited for so many reasons! First off . . . SPRING is just around the corner! Let's all say a BIG Amen for that. Less layers, garden planning and most importantly, no more SNOW. Secondly, the new season brings on a whole new look and feel for the cottage. New old stuff is coming in to give your home a fresh updated look for the season. Dressers, vintage chenille, console tables, farm tables for your front porch, handmade birdhouses, you name it, we've been shopping for it. But probably the biggest reason for change to the cottage is the welcomed addition of Ekster Antiques! Caroline and her incredible European one-of-kind look will be joining forces with the cottage gals to bring you the best of the best. We are so excited about this colaboration and the opportunity to bring our customers some of the most unique and vintage finds around and all at incredible prices! That's good news. Looking forward to fabulous pics on your website . . always so pretty!